We encourage our customers to keep us posted with what is happening as their German Shepherd grows. How they adapt, what they think of their conformation, coloring,and how their personalities develop. We get both verbal and photo feedback. As you know, we were looking to replace our shepherd that had to be put down. You indicated we could never find an exact duplicate. (they are one of a kind) You were right, but he has a personality that we really are beginning to appreciate. Each will have his place in our memories. Thank you. The brochure was wonderful. It really seemed to work. She only had one accident. As you indicated, we also need training to recognize what she was trying to tell us. 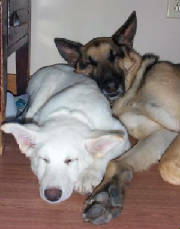 Shadow and Caesar's pup from 2001. They took to each other instantly. These 2 litter mates and 2 house cats co-exist in West Des Moines.